Heartburn is the worst. It can happen at the most inopportune times. You went out and had a great dinner (maybe some drinks, too), you’re lying down in bed, and it just hits you. Burning in your chest and throat, making sleep and comfort impossible. But what does heartburn feel like exactly? Can heartburn really feel the same as a heart attack? It’s important to know the difference between heartburn and other conditions. The following is a basic guide to heartburn so you can recognize it and distinguish heartburn from other issues of the stomach and chest. This will help you treat it correctly and get on with your day. Even though the causes of heartburn can differ from person to person, describing what heartburn feels like is actually pretty straightforward. It’s a burning sensation in your chest that sometimes radiates to the throat area. Depending on the person, signs may be more specific. Here are some examples of heartburn symptoms. Heartburn may cause other symptoms like a cough or a sore throat. It may even make your voice sound rougher. This is all due to what heartburn is. Heartburn happens when stomach acid comes up into the esophagus due to the relaxing or opening of the lower esophageal sphincter. This is why most of the symptoms of heartburn feel like burning and occur during or after eating. Unfortunately, these symptoms can be very similar to other health conditions that may have more dire consequences for your health. Gallstones are caused by a buildup of minerals that can go on to block your bile, duct causing pain and discomfort. 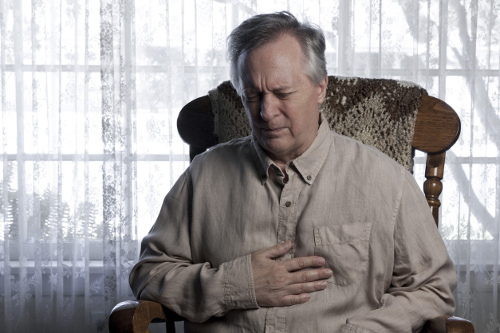 Gallstones can mimic heartburn by causing stomach pain, usually after eating. This occurs when part of your upper stomach works its way through the diaphragm and into the chest cavity. Hiatal hernias can cause excessive belching, nausea, and chest pain. What can make matters even more confusing is that hiatal hernias sometimes cause heartburn and acid reflux. A side effect of diabetes that isn’t kept in check is nerve damage to your digestive track. This is called gastroparesis, and much like a hiatal hernia, it can mimic some of the symptoms of heartburn as well as serve as an actual cause of heartburn. Esophagitis is the inflammation of the esophagus and can cause the tight burning sensations in the chest that are similar to heartburn. These are two different types of chest infections. Costochondritis is the inflammation of the cartilage that connects the ribs to the breastbone. Pleuritis is the inflammation of the linings of the lungs and chest cavity. Both of these inflammations can give the chest a burning-like pain that is very similar to heartburn. Unfortunately, there is another issue that can cause can feel very similar to bad heartburn: heart attack. While heartburn can cause a number of health problems, the condition itself is not life threatening. Heart attacks, however, can definitely kill you if they’re severe enough and if you don’t get help within an appropriate time frame. The problem is the symptoms of a heart attack can be eerily similar to those of severe heartburn—so similar that sometimes even a doctor might have a hard time differentiating the two. Complicating matters is the fact that what may be triggering a heart attack can also trigger heartburn. Luckily, there are a few points to keep in mind that separate the two. Both heart attacks and heartburn can come with sharp chest pain as well as squeezing pains in the chest. In the case of a heart attack, the chest pain is a warning sign. It starts off bad and will worsen as the heart attack occurs. Heart attacks usually come with a few differences. Shortness of breath, dizziness, and cold sweats (breaking into a sweat for no particular reason) are all more associated with heart attacks than heartburn. Heart attacks will also respond to nitroglycerin pills, while nitroglycerin will not help heartburn at all. The most important thing to remember is that if you think you are having a heart attack, head to the emergency room and see a doctor right away. The last thing you want to do is waste time in the case of a heart attack. If you are wrong, the worst that will happen is you get help for your heartburn and a chuckle. Better that than suffering serious health consequences or even death due to a heart attack that you thought might be heartburn and were too embarrassed to confirm with a professional. Heartburn can be painful. Painful enough that its symptoms can be confused with the symptoms of a heart attack. But luckily, it can be dealt with as there are a number of medical treatments and natural remedies that can help turn the burning feeling in your chest. But that only happens if you seek treatment. And if it turns out not to be heartburn, the doctor might be able to help you stop a more serious health issue before it takes hold and causes more problems than you want to deal with. “Heartburn Symptoms,” Web MD, http://www.webmd.com/heartburn-gerd/guide/diagnose#2, last accessed April 12, 2017. “What Does Heartburn Feel Like? How to Know What You’re Really Feeling,” University Health News, http://universityhealthnews.com/daily/digestive-health/what-does-heartburn-feel-like-how-to-know-what-youre-really-feeling/, last accessed April 12, 2017. Harding, A., “9 Serious Conditions That Mimic Heartburn,” Health, http://www.health.com/health/gallery/0,,20528575,00.html, last accessed April 12, 2017. “Heartburn,” Mayo Clinic, http://www.mayoclinic.org/diseases-conditions/heartburn/in-depth/heartburn-gerd/art-20046483?pg=2, last accessed April 12, 2017.